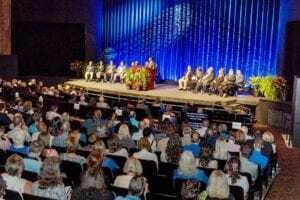 MURFREESBORO, TN — MTSU President Sidney A. McPhee kicked off the new academic year Thursday, Aug. 23, by applauding the university’s faculty and staff for continued progress in student retention and graduation while emphasizing the need to develop new strategies in an ever-evolving higher education landscape. Now in his 18th year leading the Blue Raider campus, McPhee addressed a capacity crowd of faculty and staff inside Tucker Theatre during his annual State of the University remarks as part of the traditional Fall Faculty Meeting in advance of classes beginning Monday for fall semester. “The calling to make a difference in the lives of others — the passion that drew each member of our academic community to fulfill careers in teaching, research, service, and providing mentorship — is the ultimate goal of our institution,” he said. annual State of the University address. Another highlight of the gathering was the presentation of the MTSU Foundation’s Career Achievement Award, this year going to Judith Iriarte-Gross, a professor of chemistry at MTSU since 1996 who is nationally known for her advocacy for girls and women in the sciences. Iriarte-Gross is director of the Women In STEM (WISTEM) Center at MTSU and the founder and director of Tennessee’s first Expanding Your Horizons girls’ STEM education workshop. STEM stands for science, technology, engineering and math. He cited the increase in full-time freshman retention rate from 69 percent in Fall 2013, when the university first began its student success initiatives, to 76.8 percent in Fall 2017. 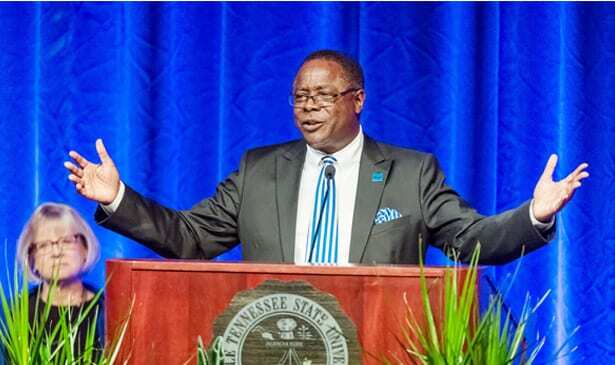 MTSU’s efforts have become a national model, he said, with media outlets such as The New York Times, the Washington Post and the Chronicle of Higher Education taking note. He commended University Provost Mark Byrnes and Vice Provost Rick Sluder for leading the retention efforts and touted a list of other achievements from across the university — from funded research to accelerated graduate programs and from athletic successes to ongoing support for student veterans. 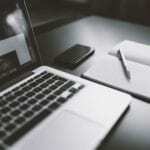 “Our proven ability to educate graduates with the least amount of taxpayer dollars per-student is something in which we can, and should, take great pride,” he said. McPhee also announced Thursday that the MTSU Board of Trustees earlier this summer approved his recommendation for a 1.5 percent across-the-board salary increase for employees while also approving the use of $3.7 million in state and university funds for partially implementing a compensation plan to make MTSU salaries more competitive over time. MTSU’s new 91,000-square-foot Academic Classroom Building will provide a state-of-the-art facility for the College of Behavioral and Health Sciences, including much-needed classroom, office and lab spaces for the Criminal Justice, Psychology, and Social Work departments. The $36 million project is expected to be completed in Summer 2020. Renovations at Peck Hall are nearing completion and include new ceiling and lighting for the breezeways, new lighting for the corridors, refinishing of the flooring on the second and third levels, and new furnishings for the courtyard areas. The long-running Middle Tennessee Boulevard widening project is expected to be finished in December. Parking Services will have new facility located on City View Drive on the southeastern edge of campus, with completion expected by the end of 2019. Alumni and supporters donated more than $12.7 million in gifts in the last fiscal year, which exceeded the previous year. Discussions continue regarding the potential transfer of the Valparaiso University’s law school to MTSU. Such a transfer would result in an estimated gift value of $35 million to $40 million. 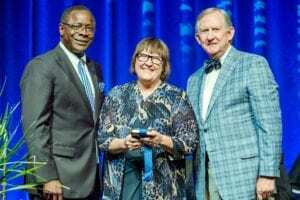 MTSU chemistry professor and nationally recognized STEM education advocate Judith Iriarte-Gross, center, proudly accepts the 2018 MTSU Foundation Career Achievement Award from MTSU President Sidney A. McPhee, left, and MTSU Foundation President Ron Nichols, right. federal programs such as TRiO and Upward Bound played in helping a young, first-generation college student from a single-parent home enter higher education and pursue the sciences with the encouragement of teachers and mentors. Iriarte-Gross also is a fellow of both the American Chemical Society and the American Association for the Advancement of Science, two of the country’s premier scientific professional societies, among her many honors. “I tell my students today, listen to your teachers because they see something in you that you might not see,” she said. When she and husband Charles moved to Murfreesboro in 1996, Iriarte-Gross recalled that she noticed the absence of an EYH program for young girls anywhere in Tennessee. She went to work launching one on the Blue Raider campus that will host its 22nd edition in October and has since been joined by five other EYH programs across the state. “We are changing the future STEM workforce for Tennessee by showing girls that they can do anything,” she said. The Career Achievement Award is presented annually to a professor at MTSU and is considered the pinnacle of recognition for the university’s faculty. It is given at the Fall Faculty Meeting as part of the MTSU Foundation Awards, which include a variety of awards recognizing outstanding faculty members. Find the full list of winners at www.mtsunews.com.